Our roots date back to when our first members chartered Machinists No. 17 Federal Credit Union in 1952. They all belonged to or worked for the International Association of Machinists. Three years later, Clark County employees chartered their own financial institution, Clarkco Employees Credit Union. During the 1960's, both credit unions grew steadily. The people-helping-people philosophy of credit unions was catching on and the services they offered — savings accounts, personal loans and auto loans — were increasingly popular. To better serve members, in 1973 Clarkco became federally chartered. Members soon were introduced to share drafts, a new checking account developed exclusively for credit unions. The number of Clarkco members quickly increased, as did service use. Meanwhile, in 1975 Machinists No. 17 Federal Credit Union changed its name to Hazel Dell Federal Credit Union. Later, the name changed again to Midco Federal Credit Union. Once again seeking to serve both credit unions' members with better and expanded service, Clarkco and Midco merged in 1988 to become Clark County Community Credit Union. With more than 5,300 members and $17,000,000 in assets, the credit union expanded to provide service throughout north Clark County. Soon after the merger, a Battle Ground office was opened. In 1999, Clark County Community Credit Union became People's Community Credit Union, later People's Community Federal Credit Union. The name change reflected our growing commitment to expanded service throughout Clark County. 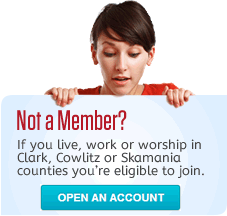 Today, People's Community Federal Credit Union can serve those who live, work or worship anywhere in Clark, Cowlitz and Skamania Counties. With over 12,000 members and $205,000,000 in assets at the end of 2016, we are a strong and creative financial services institution. We fulfill our people-helping-people mission by serving our members’ financial needs. When you join People's Community Federal Credit Union, you become a member/owner. You immediately begin to enjoy our high-quality services, low fees and great rates. The credit union is governed by a volunteer board of directors, elected by and from the credit union's membership. As a member, you don't just use our credit union. You own it. You have a voice in what we do. Because we're member-owned, we answer only to you. There are no stockholders to please. Nor are we motivated by profits. Like all credit unions, we're a not-for-profit financial cooperative. We return earnings to our members in the form of lower loan rates, higher dividends on deposits, and lower fees. No matter how much you have on deposit or owe in loans, each member gets one vote on matters such as board elections. Our Money Management Account is not tiered like at so many other banks and credit unions. You earn the same rate whether you have $1,500 or $150,000 in your account. Everyone that’s approved for a loan gets the same rate; it’s not based on your credit score or the factors used by most other lenders. At People’s, you’re a person not a credit score. We always strive to bring our members the very best package of financial services. Loan rates are low. Savings rates are high. Fees are low or nonexistent, and services are plentiful. We offer everything from auto and RV loans to mortgages and home equity lines of credit. We're convenient, too. You can come to a branch and see our happy, friendly staff. Use our 24/7 Live Call Center. And do just about anything you need in Online Banking.